From highly acclaimed urban fantasy author, Joshua Bader, comes the MODERN KNIGHTS Box Set. 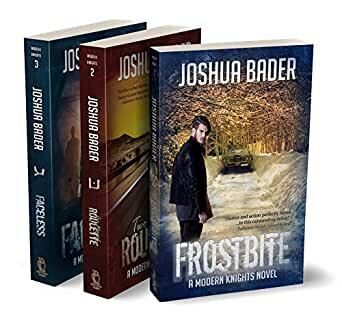 The collection contains books 1 – 3 including Frostbite, Two Wizard Roulette, and Faceless. Start your adventure today! Getting hired to be a personal wizard for a billionaire may just become a death sentence. Colin Fisher is a young man with a lot of problems on his plate: a dying father, a dead car doubling as a home, and a mysteriously disappeared fiancée. You’d think with a magical inclination, he’d be able to turn it all around, but not so much. Yet, his bad luck appears to be on the way out when the CEO of a multinational corporation offers him a job. It’s a sweet gig as a personal wizard with a fat paycheck. The catch? The paranoid CEO isn’t a mere hypochondriac, he’s been hexed with an authentic ancient curse. Now Colin is the only thing standing between his new boss and a frozen bundle of fangs, claws, and rage. If he can’t stop the cannibal ice demon in time to save his new boss, it’ll be back to living out of his dead car. That is, if he even survives the battle. While working as a personal wizard for a billionaire, the stakes have never been higher. Being a personal wizard to a multinational CEO isn't all fun and games. When Colin's not busy with assassins and his own inner demons, there's amnesia potions and odd jobs like hunting down a serial criminal or two. If the billionaire boss was bad, the relationship between Colin and his demon-blooded girlfriend Veruca has been downright turbulent since last winter's freak blizzard. It doesn't make the situation any easier that his favorite FBI contact looks exactly like his missing, presumed dead, fiancé. All of that would be enough to keep Colin busy. But when a dangerous gambler with magical powers of his own, and his demoness consort, start fleecing Vegas casinos for millions, Colin finds himself trapped in a high stakes game of two wizard roulette. The Race is on to Save Colin and Bring Him Back from the Beyond. Even if being a personal wizard to a powerful CEO has its perks, Colin Fisher’s body and soul have paid for these benefits with every case. From stopping a crime spree by a demon pact wizard to killing a relentless ice demon, he's been on the job. Yet he still doesn’t know what happened to his fiancée on the night he gained his magic. To solve that mystery, he will have to pay the highest price yet. On the floor of his arcane sanctum, in a self-induced coma, he’s trying to peel back the layers of time and solve the enigma. But if he does, he may never wake up. Meanwhile, the two women who love him have their hands full trying to keep him alive while he’s on his spirit journey. Veruca Wakefield, demon blooded assassin, and Andrea Deveraux, FBI trained agent, will have to work together if they are to defeat both threats and save Colin.